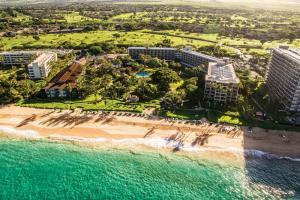 This beautiful hotel is set amongst 11 acres of tropical gardens along Ka`anapali Beach. Guests experience traditional Hawaiian touches with quilt bedspreads and tropical furnishings. Enjoy the whale-shaped pool and complimentary Hawaiian activities and Hawaiian entertainment. Taste Maui's best regional cuisine, as the hotel's restaurant was voted "The Best Hawaiian Cuisine" by the locals. Departing guests are honored in a special Lei Kukui ceremony. Beachfront in the Ka`anapali Resort area between Whalers Village Shopping Center and Sheraton Maui. 25 miles from Kahului Airport and 4 miles from Kapalua West Maui Airport. Maui Oceanarium, Golf, Volcano Trips, Helicopter Tours, Hana Adventures, Sailing Trips, Luau, Hike Maui, Snorkeling, Scuba, Haleakala tours.